Winner of seven Emmys and a Golden Globe, this hit legal thriller stars Glenn Close as ruthless litigator Patty Hewes and Rose Byrne as her ambitious protegee, Ellen Parsons. The series became famous for its plot twists, nonlinear narrative, and powerful cast including William Hurt, Marcia Gary Harden, Lily Tomlin, and Ted Danson as a really bad guy. "Damages is dynamite"--Detroit Free Press. Set includes all 5 seasons. 59 episodes, 46 hrs, 15 DVDs, CC, SDH. Mature audiences. 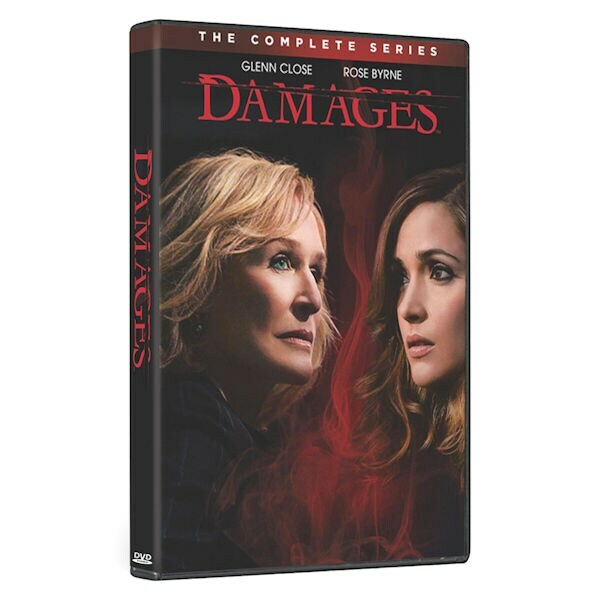 Damages is the recipient of 66 industry award nominations and 11 industry award wins. Glenn Close received a Golden Globe for Best Performance by an Actress in a Television Series - Drama and she received two Emmys for Outstanding Lead Actress in a Drama Series. Damages was also nominated for several Screen Actors Guild Awards.